There’s nothing better than a yummy, gooey, cheesy casserole! 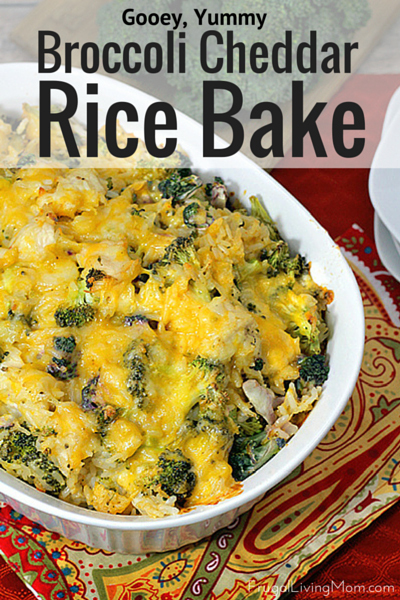 And there is something about Chicken Broccoli Cheddar Rice Casserole that is just delish. If you need to go vegetarian, you can easily leave out the chicken. My family loves this kind of meal… such a comfort food. -In a large bowl put the broccoli, rice, chicken and cheese. Mix all of these ingredients together until it is well blended. -Put the butter, diced onions, and diced garlic in a pot together cooking on low temp until the onions become soft. -Dissolve the chicken bullion cubes or broth packet in the milk. -Add flour to the butter, onion, and garlic mixture, stirring until mixed. Continue to cook until the flour turns to a pale brown color. Pour in milk, whisking often bringing to a medium heat until the milk thickens. Set aside. Add in the spices. Stir well. -Prep the baking dish (9 X 9) with baking spray. -Pour the sauce over the steamed broccoli, rice, chicken and cheese mixture. Stir to blend the sauce throughout the entire bowl. -Transfer the above ingredients into the baking dish. -Bake at 350 degrees for 30 minutes. Remove from oven and sprinkle the top of the casserole with the remaining cheese. -Bake at 350 degrees for additional 10 minutes. -Allow to cool slightly before serving. -Pour the sauce over the steamedbroccoli, rice, chicken and cheese mixture. Stir to blend the sauce throughout the entire bowl. Hey Lena, thanks. Originally the recipe was suppose to have it, but I decided against it. But the wordage never made it out! Thanks I fixed it.